Every HR manager has realized by now that seminars that require physical attendance are a time-consuming and expensive way to organize the employees’ further education. This is why more and more companies have started to implement elearning solutions. 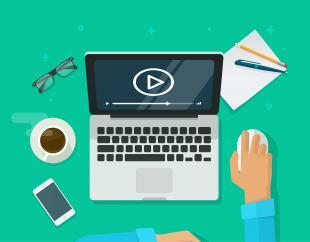 When it comes to achieving high-quality content, the video-based format is gradually replacing the rather impractical, mostly flash-based, click-by-click formats. And there is a good reason for this: the video’s animated images stimulate several senses and are, therefore, perceived as being more entertaining than reading texts alone. Furthermore, video learning is not only more time- and cost-efficient but also pedagogically effective and, when applied properly, also easy to successfully integrate into the day-to-day work. The study “Podcasting and Video Productions to Create Valuable Student Learning Experiences” revealed that 95% of students feel that video-based elearning has partially helped them greatly to nurture their skills to work as members of a team. 97% of them think that video-based elearning constitutes a very appropriate learning strategy. It is not difficult to see that what is true for students can also be true for employees in a company. It is safe to say that the rise of video learning has arrived in the corporate world. A change in the line of thinking is clearly becoming apparent. The learning experience can and should be increasingly interactive. At the same time, learners want to be able to structure their training sessions autonomously. Nowadays, further education measures take place in a dynamic world of knowledge—it is important to remember this. Thus, it did not take us by surprise that the demand from business customers has downright exploded in the past two years. Among them, many major corporations which burnt their fingers with elearning in the 2000s and are now looking for a modern and sustainable solution. The challenge for us elearning providers is to offer companies solutions which optimally meet both the company’s as well as the employee’s needs. Of course, video learning can happen without a moderator / instructor in the picture, but in our experience, it really helps, you can of course show anything and he does not have to appear all the time. Just as in sports, in self-paced learning it is also important to keep up and strengthen the motivation. Elearning requires the learner to constantly motivate himself. This becomes especially difficult when training sessions are completed not because the learner is particularly interested in the topic itself, but because the employer has mandated it. On the one hand, the responsibility lies within the company which has to be able to motivate its employees by way of an incentive system. Developers of video-based courses, on the other hand, could also make an important contribution to improve the situation. First of all, by selecting top-notch instructors. When choosing among candidates, it is important to remember that the best expert is not automatically the best teacher. Truly great video courses can only be achieved by combining expertise with a didactically coherent and enthusiastic presentation. This is why, for example, instructors such as Dan O’Connor are in high demand to get people excited about the topic Business Communication Training. Personnel managers are faced with the challenge of having to measure both the success as well as the attendance of training sessions. The learning effect is not guaranteed by merely playing the video—we all know that we can only successfully learn something when we are really paying attention. Therefore, video courses should also include quiz questions. Answering complex questions on the topic enables us to measure the success of the training. Additionally, this interactive element increases the learner’s attention and raises the entertainment value of the lecture. Learning today no longer takes place in the seminar room but mostly within the work process itself, basically in the same place where employees must also apply the newly acquired knowledge. Video courses must, therefore, be designed with the purpose of delivering the information exactly when and where it is needed. It is important to enable the user to quickly and directly access the specific learning nugget needed at a particular moment. This is achieved by either keeping the videos very short or by providing longer videos divided into chapters that are clear, informative and easy to navigate. This certainly requires editorial skills to create the video, and an advanced video player in order to guarantee an easy navigation. Martin Schlichte is founder and CEO of the elearning provider Lecturio. He is particularly committed to adapting elearning applications to the modern requirements and needs of companies and individuals.